One of the biggest requests I get from clients is “Help me with my Cravings!! !” The frequency and urgency of this request starts peaking in September and October, just as the weather begins to cool and seasonal Pumpkin Spice ‘all the things’ and holiday goodies bring out the roaring FOMO Beast in us all. The cause and solution to cravings is as unique as you are, so there is no one solution that I can say works for everyone. However, this year I have created a program that addressed the Physical, Emotional and Spiritual roots of cravings and offers solid tried and true methods I have used with individuals in my practice for almost 15 years. Here we leave no stone unturned and no area unexplored! 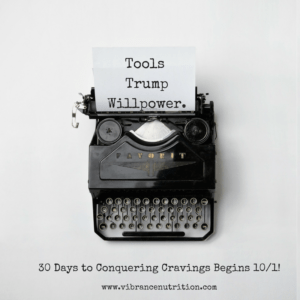 From cravings rooted in childhood memories to those that stem from entitlement, loneliness, or low blood sugar, 30 Days to Conquer Cravings will provide you with key insights and immediately applicable tools to give you the awareness and skill set to successfully tame Holiday Food FOMO (that’s fear of missing out). Creative ways to fill your heart and spirit and turn off the need to fill your belly. This program is chock full of all the tips and tools I have learned in the past 20 years of working through my own relationship with food and facilitating others through theirs. It represents tens of thousand of hours of hard work, tears, and deep introspection as well as the gifts and resources given to me by my mentors and teachers along the way. I’d never found a way to share everything I have ever learned – until now. You do well all day long and come home only to cave to temptation and ‘ruin your hard work’. You ‘know what to do, but just aren’t doing it’. You gain 5-15 pounds over the holidays and spend the next year trying to work it off again. You have, or think you may have, an active eating disorder. You are right in the middle of a period of unusually extreme stress (divorce, death, bankruptcy, etc). You are unwilling to look at your feelings, your past, and your attitudes that keep you stuck in an unhealthy relationship to food. Now is the PERFECT time to begin this program. The chaos of summer has ended, weather is cooling, and the change is seasons has cravings building. By committing to this program today, you ensure you step into our food-filled holiday season armed with the tools, resources, and support to successfully navigate your way to January. daily education emails offering powerful exercises that will identify causes and solutions appropriate to YOU, time-tested tips and tricks to immediately put to use and loads of encouragement and support. Access to me through a closed Facebook group and a private 30 min. coaching call at the start and end of your program. The camaraderie, encouragement and creative brainstorming of our online community! Working in a safe group was key to overcoming my unhealthy relationship with food. There is nothing as powerful as a safe group of committed, supportive individuals working together for a common goal. Online programs such as New Year Diet Plans and Detoxes, healthy eating groups, and wellness groups regularly run $300 and up. They hardly ever discuss the emotional and spiritual causes of food cravings that will derail ANY food plan, no matter how healthy it is and how much your healing depends on it. To truly succeed in any healthy eating plan, you must be able to address the root cause of the things that derail you so you can have sustained success. That’s my intention behind 30 Days to Conquer Cravings. If this group were live it would cost about three times what I am offering it to you today. My private clients who work exclusively in the realm of emotional eating often spend 6 months or more working through this and don’t have the backing and creative support of a community. This is a unique opportunity that will only be offered twice a year – are you ready? Yes! 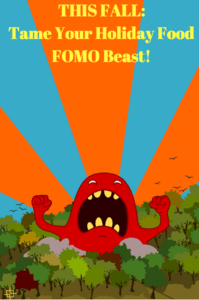 I’m totally down to tame my FOMO beast and conquer cravings today!